"Nothing will go wrong, I'm sure I've worked this thing out perfectly." Since the history of film vastly predates my movie viewing years, one of the things I appreciate most is the number of older films I have discovered through DVD. Apart from the awareness of these titles, I would have had no interest in old, beat up, poor contrast showings on cable TV. The availability of a high quality medium like DVD is encouraging the restoration of a lot of older material that would otherwise be forgotten and never be experienced by a younger crowd, and the viewing experience is greatly enhanced because of it. I can't count how many great older films I have discovered in my few years as a DVD collector. 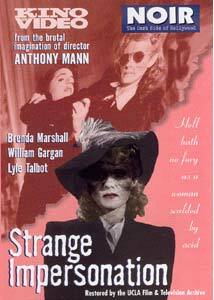 Anthony Mann's Strange Impersonation is one of those films I would probably never have seen if the DVD were not available. Although Mann is noted as one of film noir's most influential directors on the DVD package, I was unfamiliar with of his noir work (T-Men and Raw Deal are highlighted), though his western titles like The Naked Spur, The Man From Laramie, Cimmaron or the epic El Cid were much more recognizable to me. Released under Kino's "Noir" label, this 1946 film was restored by the UCLA Film and Television Archive. The film stars Brenda Marshall as Nora Goodrich, a career woman who puts her scientific research before her willingness to commit to her fiance Stephan (William Gargan). Having developed a new anesthetic, she wants to finish her lab experiments before she will concede to marriage. However, due to the bureaucratic process required before she can begin to human studies of the drug, she decides it is best to play guinea pig and do her research at home, with the help of her best friend Arline. This is when things begin to go wrong. First, Nora runs into Jane Karaski (Ruth Ford) with her car on her way home, an accident witnessed by an ambulance chasing bystander. Then, it turns out that Arline (Hillary Brooke) is after Nora's fiance, and while Nora is under the anesthetic, she sabotages the experiment, causing massive acid scarring on Nora's face and a lengthy stay at the hospital—time which Arline uses to deceive both Stephen and Nora and drive the two apart. Now disenfranchised from her husband to be, Nora returns home to find Karaski waiting to blackmail her at gunpoint. Add a fluke of circumstance that leads Nora to assume the blackmailer's identity, and you have a film that twists and turns with the best of them. The film is well paced, well composed, and keeps you guessing—they had me until the ending (which was a bit of a letdown, to be honest). There is an awful lot of foreshadowing going on which would be more subtle these days (for example, how many fiances would comment that you could fall off your balcony while in the midst of proposing?) but for the period, the style is suitable. I could definitely watch this one again. One thing I find especially interesting about many of these old films is the political and social commentary they offer. In Strange Impersonation, we are presented with a story that, on the surface, shows us a very liberated and independent career woman, though the underlying message ends up being that she should be content to just get married at the expense of her career. This type of treatment would never wash today, but I can only imagine how a 1940's audience would have seen Nora Goodrich's character. Image Transfer Review: Image quality is variable on this one, but given the age of the film, is generally pretty reasonable. The film was restored by the UCLA Film and Television Archive, and it is obvious it was edited from a variety of sources ranging from very good to not quite so good (though nothing horrible either). There is a fair deal of print damage with major rips and splotches in many scenes, and general noise or dirt in others. This isn't constant though, and there are stretches where the elements are in good condition. There is some color interference in striped patterns in a few places which is distracting in a black and white film. For the most part contrast is fairly good, though midtones tend to either a little too dark or too light depending on the shot. The image is a little fuzzy at times, the worst stretches have a side to side racking in the transfer, and murky, low contrast look. Other scenes are nearly perfect aside from a few print flaws. It is hard to be too critical of a film of this age, and the flaws mentioned above should be taken in context. Audio Transfer Review: Audio is generally pretty good, though like the video, is inconsistent throughout the film. Presented in 1.0 mono, there is some warbling in certain scenes, and the odd pop occurs at splice points. Hiss is reasonable for a film this age, and not distracting. Considering the vintage, it is in pretty good shape. Extras Review: No extras. Chapter selection is on the main menu. A single sheet insert has what appears to be a small lobby card reproduction on it. I would have liked some additional info on the cast and crew, as the players are completely unknown to me. At the minimum a bio of the director could have been included, or perhaps some info on the genre, even if that included plugs for other Kino titles. For those of us who haven't seen a whole lot of older pictures, it is tough to know the good from the bad. I didn't have very high expectations for Strange Impersonation, but was pleasantly surprised. Although the restoration isn't as extensive as some DVD releases I've seen, the feature is presented quite well here. If you like the noir genre, this one is worth at least a rental—I look forward to more titles in this line. Oh yeah, don't look at the chapter listing until after you have viewed the film. Major spoilers here!